"People back home wouldn't buy a ring if they knew it cost someone a hand." Edward Zwick may be the most earnest filmmaker working today, both to his credit and his detriment. It's like he consciously recoils from irony, and he's obviously politically committed�it's that social concern that animates a movie like Courage Under Fire, but it's also the element that tended to make Michael Steadman, the protagonist of thirtysomething, more than a little insufferable. So you might blanch a little bit when this film begins with a title card announcing that we're in Sierra Leone, 1999; it's got the trappings of the condescending moralism of lots of public television documentaries. Happily, though, Zwick weds his deep-seated anti-imperialism with storytelling of a very high quality, and has produced a swashbuckling contemporary story that need not apologize for its overtly political content. The problem with politically conscious filmmakers is that they tend to be more interested in their causes than their characters (cf. Oliver Stone), leaving their movies with the dramatic flatness of propaganda�depending on your own philosophy, you may disagree vehemently or feel like you're watching some preaching to the choir, but you're unlikely to be entertained. 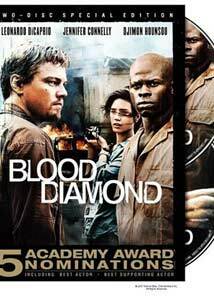 So you may well know that this movie is a searing indictment of the international diamond trade, and implicitly of the willful ignorance of the costs in blood and suffering when we're being asked to say it with diamonds�what comes as a welcome surprise is the action picture assuredness with which Zwick works. Leonardo DiCaprio stars as Danny Archer, who grew up as part of the ruling white minority in what went from being called Rhodesia to Zimbabwe; now he's a mercenary diamond merchant, the sort of unsavory character that the tony London businessmen for whom he works want to keep a safe distance from but desperately need to fill their display windows. In a previous generation, this would have been a part played by Humphrey Bogart�Archer has a world weariness, having seen and survived the worst, and now he knows only that he's got to look out for number one. I suspect it's not an accident that the character shares the same surname as Sam Spade's fallen partner, and in fact the movie borrows liberally and smartly from The Maltese Falcon. Instead of a black bird, though, the object of pursuit is a glorious pink diamond, reputedly 100 carats�it's enough to get a man out of Africa and the line of fire forever. Circumstances bring Archer a partner: Djimoun Hounsou is quite remarkable as Solomon Vandy, an African who wants only a better life for his children, when horrors rain down on his family. The R.U.F., a murderous rebel army, descends on their village, take Solomon's wife and daughter as prisoners, turn his young son into one of their warriors, and make Solomon a slave laborer in the diamond mines. Hounsou is marvelous at communicating the rage of a man who has lost everything, and wants only to reunite his family; Jennifer Connelly is the necessary and inevitable love interest for DiCaprio, playing an American photojournalist who wants to alert the world to this criminally underreported story. The set pieces of violence are harrowing�the chaos and amorality that reign is made that much more terrifying by the fact that most of the automatic weapons are being wielded by brainwashed boys who haven't yet entered puberty. Certainly there's a fierce criticism of imperialism here, but it's not as simple as white versus black�the worst horrors are perpetrated by the R.U.F. against their countrymen, and their maiming of choice is lopping off the hands of their enemies or the uncommitted as a warning. And the imagery can be as brutal as the landscape is beautiful�what is one to make, for instance, of a refugee camp with over a million inhabitants? How can we allow this to happen to other humans? The descent into the abyss has a distinctly Dantean air�as Archer says, "God left this place a long time ago." DiCaprio is asked to carry a huge amount of the movie, and he's absolutely charismatic all the way throughout�it's hard to think of another actor who could pull this off, and coupled with his work in The Departed, released the same year, it confirms that he's a performer of the highest caliber. Zwick may overplay his hand a little bit when he uses black-and-white stills, supposedly taken on Connelly's camera, as snapshots of the horror for Western media consumption; we've been watching this movie, we get it. And things wrap up kind of slowly as well�you sometimes feel that if this wasn't such a consciously Worthy Enterprise, the movie would have been at least 30 minutes shorter. But it's a finely made and deeply impassioned film without slipping into too much preachiness, and without ever losing its moral urgency. Image Transfer Review: The film is hard hitting, but the transfer is actually a little soft�colors bleed somewhat, and black levels are inconsistent. Still, some of the shots can be shocking or beautiful or both. Audio Transfer Review: A very dense sound mix that has been transferred quite well; the 5.1 track finds just the right balance between the hushed tones of the more personal scenes and the cacophony of battle. Extras Review: Zwick provides a thoughtful and extensive commentary track, and if you listen to this after watching the movie, you'll be moving quickly along the learning curve of African geography. The director goes over locations and shoot details, and the history with which his story deals; he assures us, in one of his few moments of levity, that no goats were harmed in the making of this movie. He unsurprisingly demonstrates the high seriousness that's characteristic of his work. The main event on the second disc is Blood on the Stone (50m:15s), a documentary going over the same circumstances as the feature. It's an excellent introduction to what went on in Sierra Leone, influenced by the international market, and what still goes on. Becoming Archer (08m:34s) focuses on DiCaprio and his impeccable accent; it includes on-set footage, and interviews with Connelly and Zwick. Journalists on the Front Line (05m:15s) focuses on Connelly's character, and also includes interview footage with producer Marshall Herskovitz; Inside the Siege of Freetown (10m:32s) focuses on the production team members and their work on a sequence that re-created an unthinkable historical slaughter. Finally, there's a Nas music video (02m:47s) for a song (Shine On Em) featured on the soundtrack. It plays like an unholy marriage of Apocalypse Now and Gunga Din, and will change forever the way you look at what's on your finger, around your neck or in your earlobes.